Oh god, not another year! Why does this always happen to me? We spend most of the holiday at St. Fillans in Bishop’s Stortford with Yvonne’s mother, recently widowed. She isn’t taking it well at all. January is a quiet month and cold-free, luckily. We have dinner with David Ellis (Bloomberg, Washington DC) at the Gay Hussar, the first time we’ve seen him since he left London. 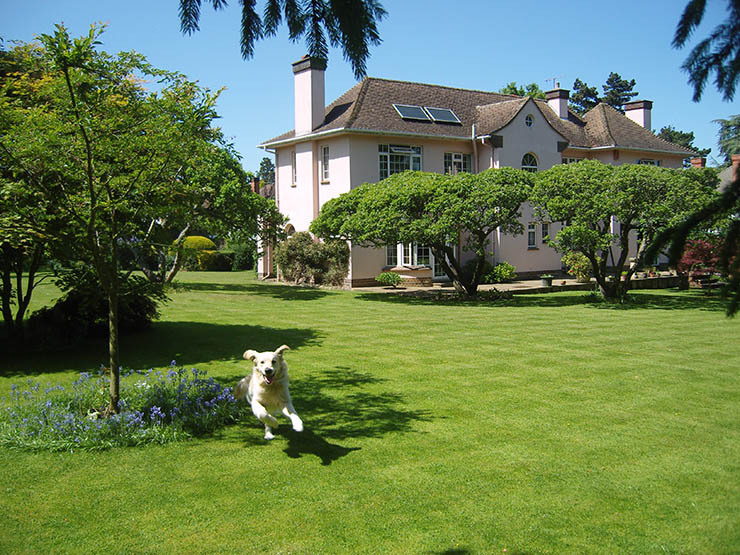 Later in the month we stay with my niece Emily & her husband Alex in their fabulous house in Ewshott. Their children Albert and Octavia are very blond, and sweet, even to me — and I don’t like children. Emily has been told not to have any more as it could be dangerous for some unspoken reason. Von has another birthday. Where does she hide them? I don’t think she looks a day older — I don’t care what everybody else says. Aha! I knew it wouldn’t be long! We both get the horrid Norovirus, and we are laid out for three days. I keep getting up and falling over. Milo the Golden Retriever has a tough time because Falling Down has replaced Walkies. Von buys a replacement car radio for the MGF off eBay, but it doesn’t work. She gets her money back and we get a spiffy DAB radio instead, which works brilliantly when it works, but mostly it doesn’t. During the cricket season it refuses to acknowledge the existence of Radio 5 Live Sports Extra, so no TMS in the car. We finally manage to get up to Harlech at the end of the month via Somerset, where we look in on a session with Pete Gage, quondam lead singer of the Sloane Squares and now a professional musician in Frome. He’s just as good as he ever was (or even better) — it was great to see him again after 45 years. We go to Christ’s Hospital for Yvonne’s uncle Bob Seeley’s Memorial Service. Very touching although I didn’t know any of the hymns, very rare for me. Bob was Toby’s elder brother, outliving him by six months. We get back to Harlech and meet up with Rosie, Von’s friend from Exeter, and her partner DS in Abersoch, which is a very naice little town clogged with Mercedes and Range Rovers and Mancunian accents. Good view of Harlech from the beach. 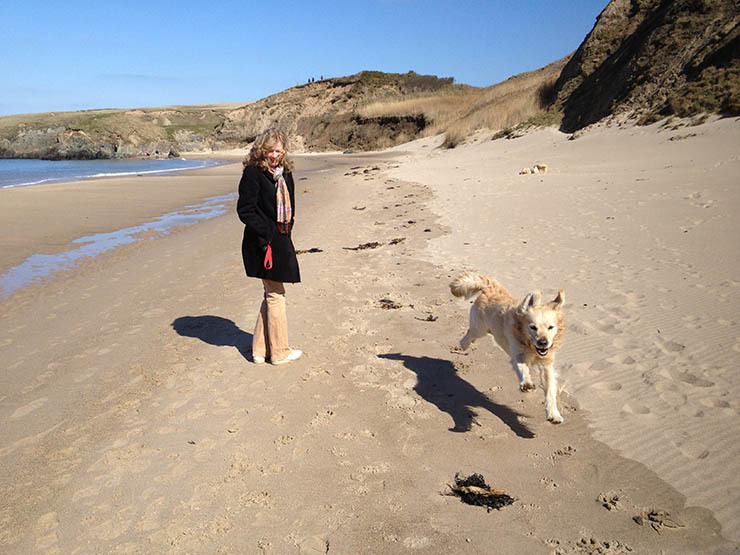 We try the Whistling Sands at Porth Oer, and yes, indeed they whistle! The highlight of the month (perhaps the year) was Wales 30, England 3. I shall say no more. The choir sings at a Groucho Club quiz fronted by Goc Wan, a TV sleb and noted homosexualist. He selects me as his object of ridicule, and prances around me as we sing, repeatedly twerking his sorry arse at me in an attempt to raise a cheap laugh. Stupid prat. Apart from a quick trip to Harlech, the rest of the month is taken up with preparation, attendance and follow-up for the London Book Fair and fotoFringe. Von has been spending much of her time away from home looking after her mother, but we now have an overnight carer for her so I can get my wife back. The carer is a traditionally built lady, and she cracks the bath open. I never liked plastic baths. We have the lights on in the kitchen all year round, and only now have we realised that it’s because the twig that was outside the window 29 years ago has since matured into a full-size Californian redwood and blots out all light. So down it comes. Von won’t let me do it myself so we hire a tree surgeon. The difference is amazing. Now we have to clean the kitchen. Whenever there’s a special offer on the Shuttle or the Channel ferry we grab it, so we take a day trip to France and Belgium. It’s not the most beautiful part of the world but the beer is incomparable, the prices are cheap and the food is exquisite. We have lunch at Ten Bogaerde, a former monastery outside Koksijde, and it is the best restaurant meal I’ve had since I was last in Belgium. It’s Thursday lunchtime, in the middle of nowhere, and the restaurant is full. How many London restaurants are full at lunch? How many London restaurants are this good? Betty, after enduring increasing pain for many months, finally goes private and has a hip replacement. St. Fillans is sold, and a bungalow will be bought for her. A book published in 1965 has been rediscovered and is storming the bestseller lists. It’s Stoner, by John Williams. I feel ambivalent about a private pleasure becoming public. This was the first book I recommended to Von when I met her 40 years ago in 1973, and it was only ours to share. Nobody else knew of the book. I selected it as one of my top ten books in this blog in 2010. Now everyone knows about it. Great! but Blast! Off to the RA Summer Exhibition for our annual count of the number of works titled ‘Untitled’. 41 this year. That’s 41 artists who are so creatively hobbled they cannot think of a title for their work. We fly to Barcelona for a week for CEPIC, the European Picture Libraries’ conference, staying in a stunning 4th floor apartment in the house where Picasso first lived. Excellent conference with 38 meetings, and at the last minute they asked me to extemporise a speech on metadata. We then take a week’s break to stay in the Catalan village of Madremanya with our old friends Jill ‘Mustard’ & James ‘The Wiz’ Lake. They drive down from their house in France to join us but their car blows up and lands them with a £6,000 bill. And I thought VW Audi was such a reliable brand. There are four attempts to rob us in Barcelona. The fourth succeeds. On the way to the airport some thief steals my jacket and camera, which contained what were surely some of the greatest photographs ever taken. On a sweltering Saturday we go to Somerset for my great-nephew Tim Lees’s wedding, preceded by a morning in the pub watching the Lions smashing Australia. A great, great day which you can read more about here. A number of old mates have their birthdays this month, so we get together for a joint lunch in Covent Garden with Nigel Paul, Brian Bates, Alan Greene, Simon Forty and others. Get home at 8pm, a good lunch. Then it’s Lord’s on Friday, England v Australia and boy, did I go on the right day — Australia bowled out during the day, 16 wickets fall, and England dominant. At least I’ve seen it once in my life. Then more birthdays: my old pal Mike Raggett’s 70th at the Union Club, and then the biggie — my aunt Mari’s 100th birthday in Aberystwyth. We drive there and back in 10 hours in the MG as Harlech has been let. A great day, and she is pleased to see us all — my brother Richard with Brenda, my sister Jo with Paul. 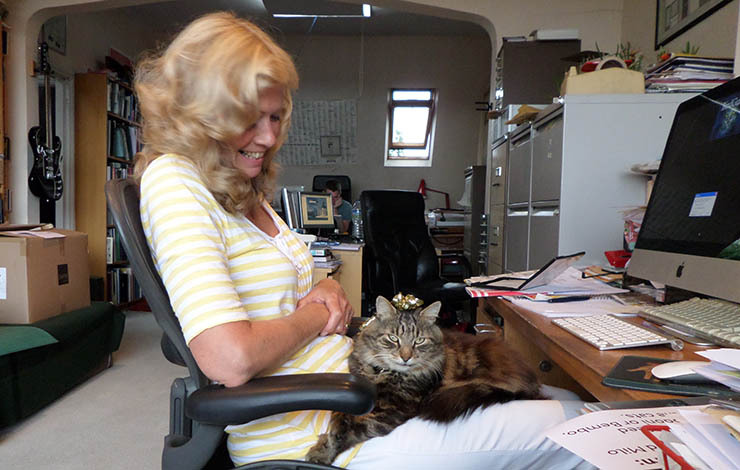 What would have been a fun month was completely overshadowed by the death of our tabby cat Bodoni. We have our summer BBQ, normally held in July but our old barbecue fell apart from rust and we had to buy a new one. Claudine, my French girlfriend from 1964 arrives from Paris and stays with us over the weekend. My father used to describe her as ‘that torrid French girl.’ She’s still hot. I have lunch with Tony Snowdon, and it’s clear he is in pain. Our friends Mike & Martha from Manhattan arrive, and we go to see ‘Thark’, a farce at the new Park Theatre in Finsbury Park. For Martha’s 60th birthday we spend a week in Istanbul; 2 Brits and 6 Americans — Martha, Mike, Steve, Melanie, Craig and Barbara. We all get on really well and have a whale of a time, seeing whirling dervishes (moving and serene), swimming in the Black Sea (warm), renting a yacht up the Bosphorus (de luxe), singing with Mike, Steve and Craig (loud), Melanie singing Dream A Little Dream Of Me on the coach (beautiful) meeting Turkish notables for dinner (fun and scary). Melanie chose the hotel. I doubt there’s an hotel in the world with a finer cityscape: the panorama from our room took in the Bosphorus bridge, Topkapi, Haghia Sophia (bang opposite) and the Blue Mosque. Wow. The day after we get back we buy an elderly but low mileage VW Phaeton. Not the ordinary, common-or-garden Phaeton but the 5 litre V10 version. Well, why not? A Phaeton is just a Bentley with a VW badge, and VW Audi products are famous for their reliability, aren’t they Wiz? I sell the Citroën C5 to the first person to view it. He is thrilled. I get my birthday present from Von — a day at the Waitrose Cookery School, learning how to cook chilli dishes. What a great present! 18 men, 2 women in the class. Surprise, surprise. Down to Hampshire for the 50th anniversary of my bro-in-law Paul’s Ordination. Lovely service, lots of tributes, then lunch for what seemed like 150+ people. Then off to Harlech for the first time since May, and a pub supper with Maldwyn & Iona. We come back via Alan Terrill’s delightful folly garden in deepest Shropshire. It’s our 40th anniversary — 40 years since I encountered Yvonne under a kitchen table in Wandsworth. Mike arrives from New York to share our anniversary (how romantic) and for our drive to the Frankfurt Book Fair. Mike is a thinker rather than a practical man, so I have to teach him how to use a camera so he can take a picture of the Phaeton’s speedo at 155mph. On a clear stretch of autobahn we reach it astonishingly quickly (750 Nm of torque, more than any other saloon car) and I say “OK Mike, now!” Nothing happens. I glance over. He’s fast asleep. Frankfurt is busy, stimulating, challenging and invigorating, as expected. I love it. This is my 38th year, so I have spent 9 months of my life at the Frankfurt Book Fair. Mike and I stay in crap hotels going out and coming back; we hope Von will book them for us next year. The phabulous Phaeton is booked in for a service and MoT immediately on my return; it behaved phaultlessly in Germany and we’ll get it back in 48 hours. Niece Emily has a third baby, Isadora. Welcome, Izzie! She had been told she shouldn’t, but all is well. My sister Shân and her husband Andrew celebrate their Golden Wedding at their flat in Victoria — oh, all right, Westminster. After a week in the garage the Phaeton has to be moved on to a VW main dealer to have its alternator replaced. I climb over its transmission tunnel and bugger my back. Lunch with Carol Smith, old mate, former ace literary agent, now bestselling novelist. Such fun that we vow to do it 3 times a year at least. I sit there grinning like a fool, but it’s actually a rictus of pain. I mean I really have buggered my back. It’s now very troublesome, hence massage, doctor, chiropractor, scan. It’s a sacroiliac problem. Nothing helps. Like acupuncture, chiropractic is a waste of time. A £175 waste of time in my case. It might help if you believe in it. Our old friend Pilch’s party in the Barbican. Never actually been inside the Barbican before. Intelligent architecture, but we get lost, of course. We have a another shuttle deal a week away, so I decide to call the Abdij Sint Sixtus to reserve some of their Westvleteren beer. This is the rarest beer in the world, mainly because they refuse to sell it commercially to shops, pubs, clubs, bars, restaurants, wholesalers, supermarkets, hotels or anywhere else. You can only buy it for personal use, and even then you’re restricted to two crates. You can only buy it at the Abbey and then only by appointment. You have to make the appointment by telephone. There is only one line. I start ringing at 9:30 with two phones and after more than 230 attempts I get through at 12:20. We are given a 4pm slot in a week’s time. In the meantime we go to the launch party for Christine Donougher’s new translation of Victor Hugo’s Les Misérables — The Wretched. 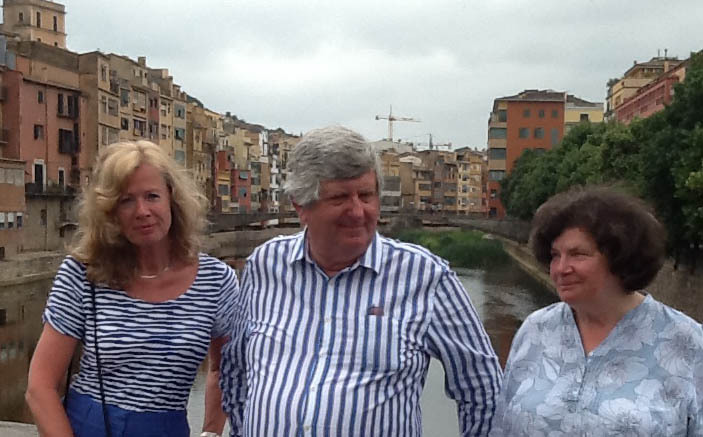 Old friends Christine and Rod have lived in Venice for the past 30 years and are now planning to move to Porthmadog. A big step up. After five weeks we get the Phaeton back with its new alternator, as well as a little small change from a £3,000 bill. Headley’s Pholly? Off to France & Belgium, and we go to Ten Bogaerde again, just as exquisite as in May. 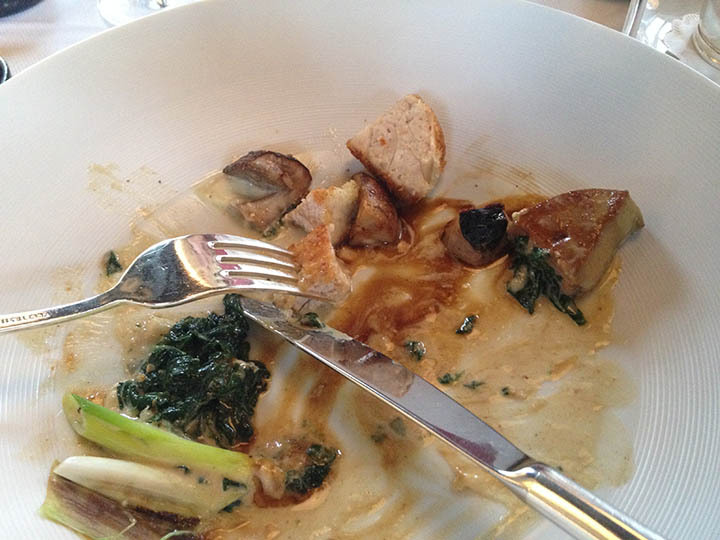 I have my favourite, ris de veau. Sumptuous. I scarf most of it before I remember I intended to take a photo; better late than never. We have to hobble fast to make our 4pm appointment with the Abdij Sint Sixtus. The Abbey has recorded our telephone number and car registration number, and we may not apply to buy their beer again from that telephone number or with that car registration number for 60 days. Even with these extraordinary barriers people still manage to sell the beer on the internet — it’s £25 a crate at the abbey doors, and £340 a crate online. Tastes like beer. Lunch with Fred & Derek, my old Collins colleagues (OK, bosses) from 45 years ago. Several hogsheads of wine consumed. Then up to Stortford to help move mother-in-law Betty from St. Fillans, the large garden and house she built 62 years ago, to a little bungalow, still in Stortford. My back renders me impotent, irritable and useless. I carry a couple of forks out of the house and drive them to the new bungalow. After three days of this Von ships me back to MVR and goes back to get on with it herself. I stay in bed for a whole day. As a result the five weeks of back pain relents into a back ache. The difference is marked. I have a busy Tuesday coming up and I hope I can cope. More social than business, but first I’m injected with Technetium, then I go to Nick Robinson’s moving memorial service in Mayfair, then his wake, then I have a NM/ICT scan for me sacroiliac, then a meeting to discuss the filming of a debate we’re organising next year in Conway Hall, then a couple of pints with the film director, then the Society of Bookmen Christmas Quiz and Dinner at the Saville Club. My team, the Quizzee Rascals, comes second to last. My back copes with it all, thank God! We go to the Varsity Match with Marcus and Sandra, and suffer more prodigious consumption in Twickenham’s West car park. fotoLibra Version 6.0 is launched after tremendous hard work by Damien. It looks splendiferous, and it is even easier to use. Every time we start the Phaeton its temperature rockets up to 130°, bells ring and COOLANT OVERHEATING alerts flash. Then everything subsides to normal. Nothing to worry about, says the VW dealer. You can carry on using the car, and we can fix it for only £900. 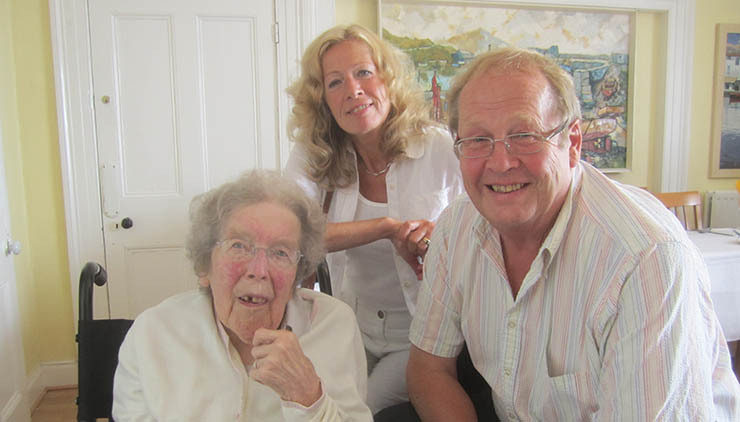 We spend Christmas with Betty in her new bungalow in Stortford. She sleeps for 24 hours over Christmas Day and spends all five days in bed. After Christmas the alternator light in the Phaeton comes on again and we fail to make it back to London. We are saved by Britannia Rescue once more. I feel I’ve spent more time in the cab of a low-loader with the Phaeton on the back than I have driving the damn thing. Then a call from Paul, our caretaker in Harlech. The storms have broken windows and torn slates off the roof in Murmur-y-Don, and we have pobl coming to stay for the New Year week. They turn up anyway. Our friends Craig & Barbara from Port Jefferson, Long Island, whom we met in Istanbul, come to MVR for a very jolly post-Christmas dinner with my sister Shân and her husband Andrew. The year closes with our MVR neighbour Rosi’s annual party, the Phaeton living with the VW Main Dealer and the rain bucketing into our bedroom from an untraceable hole in the roof. And Betty’s expensive carer has just called in sick, surprisingly on New Year’s Eve, so we have to abandon our plans and drive up to Stortford in the MG with wriggling, over-excited Milo on my lap, to stay overnight with Betty. Bonne Année, tout le monde.